We hit the road for Rockford tonight, where we’ll be spending the weekend visiting my family, meeting our new nephew, and having the last of our wedding receptions. According to Google Maps, the distance between our house and my parents’ is 320 miles, or an estimated drive of 5:46, with an hour gained by crossing into the central time zone. Tonight, however, it took closer to 7 hours. First, we hit construction just outside Ann Arbor. Then we hit stand-still traffic that continued past Kalamazoo. THEN the traffic cleared up just in time for a huge storm to break, dramatically reducing visibility and slowing us down to a crawl. The rain let up just outside Indiana, and we had about 90 minutes of smooth, weather and traffic free driving through Chicago – incredible! And THEN, near Marengo, the sky turned black as an apocalyptic storm rolled in with heavy rain and lots of lightning. With no shelter and our destination less than 20 miles away, we pressed on, in part fueled by our cravings for Beef-a-Roo. Have I mentioned Beef-a-Roo here before? If not, I sincerely apologize. I also sincerely apologize to anyone who lives far from this northern Illinois mecca of fast food, as you’re missing out on something truly special. 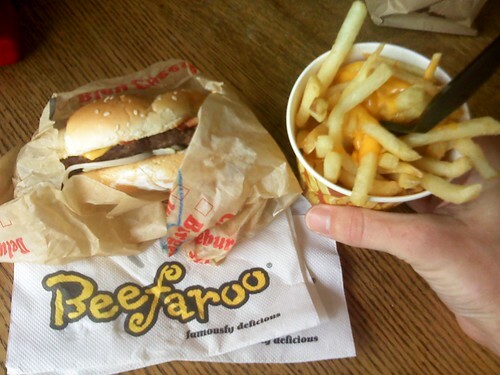 Beef-a-Roo is a Rockford institution that has been dishing out quality burgers since 1967. Each of the nine locations around the Rockford area has its own identity and decor, but all of them serve up killer milkshakes, sandwiches, salads, and fried things. Despite the titular ‘beef’, Beef-a-Roo is surprisingly vegetarian-friendly. The Veggie Club may have cemented my love for the chain in the years when I was veg but was dating a dedicated meat eater. Having renounced my veg ways, I now crave the Cilantro Lime Turkey Club – turkey, havarti, veggies, and cilantro-lime mayo on a doughy roll – along with their various chicken sandwiches and, of course, the cheddar fries. As pictured above, their cheddar fries come in a soft-drink cup, with the distribution of melted cheese basically requiring the use of a fork. Soooooo good. Beef-a-Roo doesn’t have the cult following that In-N-Out Burger has, and I really don’t understand why – except that Rockford isn’t quite the destination that California is. Alas, more Beef-a-Roo for me! Tonight, having weathered the storm and the too too long drive, I enjoyed every last bite of my Cilantro Lime Turkey Club, and then helped Shane finish his Jamocha shake. I figure we earned it. I hadn’t heard of this place, but now I am craving cheese fries! Will definitely check it out if I am ever up that way, it can be rather hard to find veggie friendly fast food on the road!